This morning, I took a ride in one of London Overground’s Class 378 trains to Shoreditch High Street station, so that I could have Leon’s version of a Full English Breakfast and a real mug of tea, in their restaurant in Spitalfields. And all for £5.25! Afterwards, I walked the short distance to Liverpool Street station and took one of Crossrail’s new Class 345 trains to Stratford station. As the Class 345 train was more or less empty, I was able to take these pictures of the inside. Several design features are noticeable. The walk-through design of the train. The wide aisle in the centre. 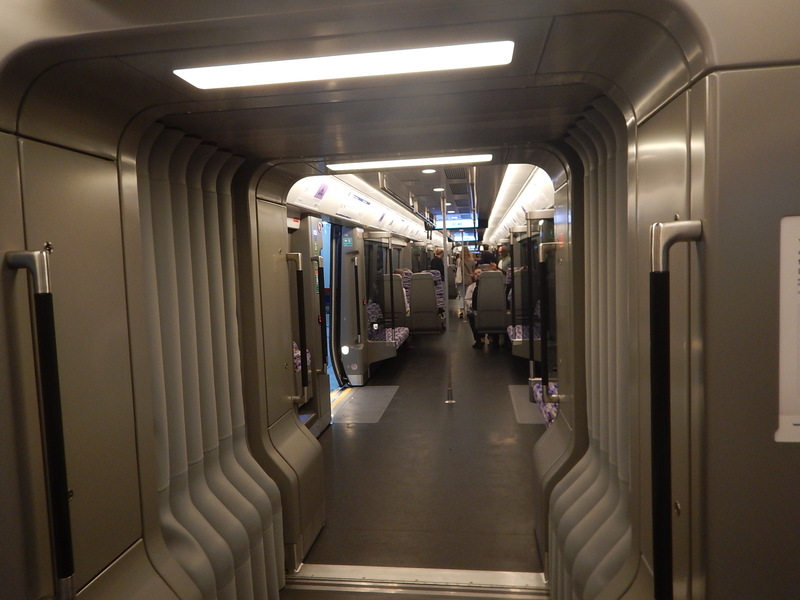 The seats cantilevered from the side of the train. The heating under the seats. The way the body sides bulge outwards to create more width at just below shoulder height. The design seems to create more room for passengers and because of the wide aisle and large windows, the room might even look more spacious than it actually is. It is certainly a more pleasing train to ride in, than the Class 378 train, I rode ealier, which is very much one of the better trains from the previous generation. Later I rode on one of Thameslink’s Class 700 trains. Seats obscure the view, as they are not aligned with the windows. The heating takes up space along the side of the train. But as the sides of the train don’t seem to be so curved, the aisle between the seats seems to be narrower. A lady wheeling a case between the seats would have hit people, if anybody had been sitting in the seats. I should ride in a full Aventra in the Peak and see if my everybody appears to have more space. I did later! On the 19th of December, I rode from Romford to Liverpool Street in an Aventra during the morning Peak. The train was perhaps three-quarters full. For some parts of the journey, all seats were taken, but the standees didn’t seem to have too much trouble standing in the smooth-riding train. Only a few were strap-hanging and several were using the backs of seats for support. It did seem to be a better experuience than other commuter trains. Others ideas and consequences have emerged in recent months. The Greater Anglia Class 720 trains have underfloor heating as I detailed in Aventras Have Underfloor Heating. Underfloor heating would appear to release space for passengers. Especially when it is coupled with seats cantilevered from the sides of the train. Tthis article on Global Rail News, which is entitled First look around Greater Anglia’s Bombardier Aventra mock-up, says this. There will be no doors separating vehicles. There is just a wide lobby, where the cars are joined together. This shows the join in a Class 345 train. Regularly in busy times on London Overground’s Class 378 trains or London Underground’s S Stock, similar areas are full with people.hanging on to the vertical handles or wheelie cases. It’s a design that seems to work well and again it makes more space available for passengers. 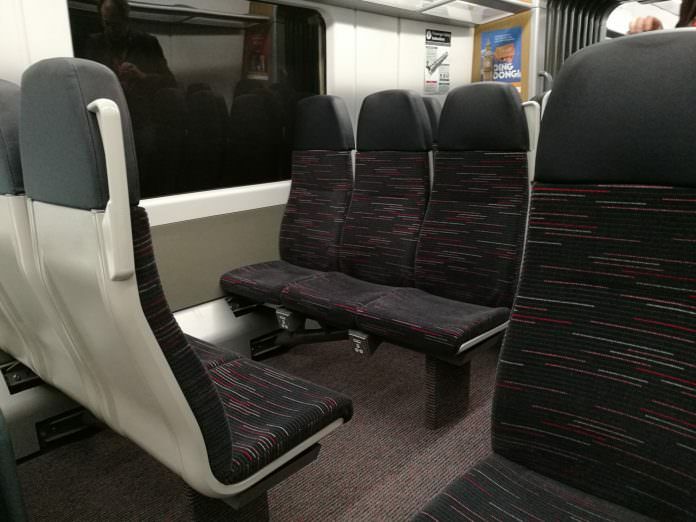 This picture shows the inside of Greater Anglia’s Aventra mockup. Could the 2+3 seating be wider and more comfortable, as Aventras seem to be wider inside at shoulder height, due to the innovative body design? Note the power sockets in the front of the seats. The first two fleets of Aventras ordered had different length cars and different number of cars. Orders have now been placed for trains with twenty and twenty-two metre length cars and three, four, five, seven, nine and ten cars. It also seems that it is very simple to change train length by adding and removing cars as required. Greater Anglia have stated that they are ordering ten-car Aventras with similar train lengths to twelve-car sets of their current rolling stock. Lengths and passenger capacity are given as follows in Wikipedia. Little if any expensive platform extensions. Especially at Liverpool Street station. Trains will fit existing depots and sidings. Nearly all trains will be fixed formations. The only disadvantage is that Greater Anglia won’t be providing any First Class seats. Judging by the lack of complaints, few seem to be bothered. But being less complicated, it would probably be a more affordable train to run and maintain. In this Greater Anglia example, another factor helps. The Aventra will only have two cabs, whereas three Class 321 or Class 360 trains will have six.So the length released by four cabs is available for passengers. It would appear that the c2c order, where ten-car Aventras replace twelve-car Electrostars, is another application of the same philosophy, that was used by Greater Anglia. This is an extract from c2c’s Press Release. The Aventra is one of the fastest-selling trains in the UK rail industry, and these new trains will be manufactured at Bombardier’s factory in Derby. Each new train, which will operate in a fixed set of 10-carriages, will include over 900 seats, plus air-conditioning, wifi, plug sockets and three toilets onboard. Each new carriage is larger and contains more seats than on c2c’s current trains, so each 10-carriage new train provides capacity for 15% more passengers onboard compared to a current 12-carriage c2c train. So three x four-car trains working as a twelve-car train are replaced by one ten-car train, just as with Greater Anglia. Note the claimed fifteen percent capacity increase! West Midlands Trains have ordered three sets of Aventras. 16 x five-car 110 mph trains for long-distance services. 29 x five-car 110 mph trains for electrified suburban services. 36 x three car 90 mph trains for Redditch to Lichfield Trent Valley. Fleet 1 will probably be used to augment the Class 350 trains in pairs on long distance services. Could these work in pairs that split and join en route to save paths into Euston? Fleet 3 will be direct replacements for the Class 323 trains and will probably work in pairs. Would a five-car train have a similar capacity to two three-car trains working as a pair? Would some of the five-car trains in Fleet 2 be fitted with diesel powere-packs or batteries, so they could run services on lines without electrification? West Midlands Trains must have a plan, or there will be a large number of trains sitting in sidings. It looks to me like Bombardier have designed a train, where more passengers can be accommodated, without sacrificing passenger comfort.